Waterfront Park and the San Diego County administration building. Photo courtesy San Diego County news center. Local, state and federal offices will be closed Thursday for the Thanksgiving holiday. 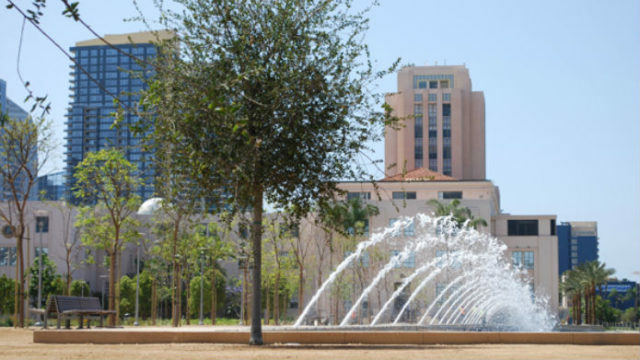 In the city of San Diego, that includes administrative offices, libraries, recreation centers, municipal pools, Chollas Lake, the Tecolote Nature Center, the Mission Trails Regional Park visitor center and the Miramar Landfill. The San Vicente Reservoir will be open. So will municipal golf courses, but the links will close at 3 p.m. In the county of San Diego, administrative offices, libraries and animals shelters will be closed Thursday and Friday. Also closed through Friday are community and teen centers in Fallbrook, Lakeside and Spring Valley. County parks and campgrounds will be open. The Metropolitan Transit System said its buses and trolleys will operate on a Sunday schedule. Most express and rural bus routes won’t run. Buses and trolleys will run on a normal weekday schedule on Friday, with some minor exceptions for bus routes. North County Transit District buses, trains and light-rail will operate on a Sunday schedule and return to normal on Friday. Coaster fares will not be accepted on Amtrak Surfliner trains through Sunday.